I must admit I wasnt really in the market for a camera crane until I set eyes on the iFootage M1 Mini Crane. Sure, I love seeing craning shots in a film - and I understand perfectly how these types of shots give the viewer an additional and otherwise unavailable perspective to A scene but it all seemed like a lot of aggravation and a very cumbersome piece of grip to cart around with you. Most solutions Ive used in the past were extremely heavy and tricky to set up and, more importantly, often took more than one operator to get them ready for action. Added to all this they would all be a little bit overkill for use with my DSLR. The iFootage M1 Mini Crane has changed all this. I dont think I really need to explain what a moving crane shot will add to your productions other than whats already been said in my DVUser article and blog (www.video-artisan.com/varavon-camera-slider/) on sliders and adding Temporal Parallax to your productions. Cranes do pretty much the same thing but on a vertical plane. However, the other thing that cranes can give you is a very different and often privileged point of view of a subject. At the lower end of the scale a crane will enable you to position the camera at floor level even lower than you can get when using some tripods and at any angle to your subject. At the higher end a crane will enable you to get a birds eye view of the subject or scene which is often a very impressive shot and a great was to establish a new scene. Whilst the extent of this birds eye view is obviously limited by the cranes length, as proven by my experience so far with the iFootage unit, you dont have to go much beyond the height of a regular tripod in order to create some quite impressive shots and sequences that will give your audience an otherwise impossible and privileged point of view. Also linking back to my previous article on sliders, the iFootage unit is actually light enough to use in conjunction with a slider to generate some quite awesome camera moves and effects. I cant honestly say Ive tried this out as yet but Im gagging to find a situation where I can put the two together and prove the point. The deal-maker for me on this crane is just how lightweight it is and how compact it becomes when packed down. Measuring just 75cm and weighing a little more than a bag of sugar, this is about as transportable as you are ever likely to get for a crane with a fully extended length of 2 metres and a payload of up to 5Kg. 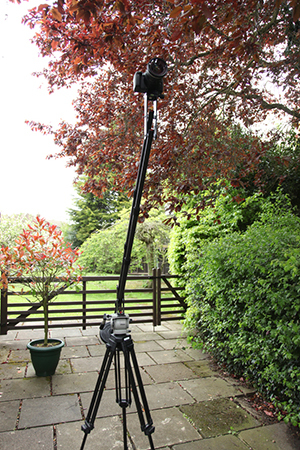 At £315.00 (ex vat) its also extremely good value for money and the most cost effective carbon fibre crane on the market. Theres no doubt that this unit has been designed with the DSLR and compact camera shooter in mind. Im often on shoots in Central London these days and go as light as possible so I can take the tube where possible. Whilst this is so much cheaper and quicker than driving in it normally means stripping my shooting kit back to the absolute basics. However, the iFootage crane is so compact that I would barely know I was carrying it with me. Supplied in its own carry case its no more hassle than carrying a two-piece snooker cue not that Id be doing that but it gives you some perspective. The crane achieves its incredible low weight through the use of high-grade carbon fibre engineering. Breaking down into two sections for storage, the system can be deployed single-handedly in a matter of moments. The central pivot section is quickly attached to a standard tripod head plate with a single screw and a locking pin system that prevents any shift between crane and tripod plate. The rear handle section then slips into the main crane section and tightened into place. This can be moved back and forth to achieve fine balancing once the entire crane is assembled and camera attached. Additional accessories, such as a remote monitor, recorders or lights, can be mounted to the unit using eight threaded holes located within the side plates of the central pivot and camera-mount end of the unit. The front section of the crane is extended up to its full length by loosening and tightening locking collars on both the upper and lower carbon fibre poles. This independent adjustment enables you to adjust the cameras angle to the subject which is maintained through the craning action. You can of course alter the cameras angle during a craning shot by applying a tilt to the tripod head that the system is attached to. Whilst this does take a little practice to get right it will give you the effect of having a remote pan and tilt head attached to the end of the crane so as the crane rises the cameras angle of view changes to keep the subject in frame. The camera mount end to the slider includes a quick release plate system and an inbuilt left/right spirit level. This is an important feature of the unit and should be checked and adjusted once the entire system is fully configured by loosening the collars on the poles and levelling off the head before tightening them again. The only additional thing youll need (that is not supplied in the price) is a small collection of dumbbell weights that slip on to the handle section of the crane (Ive got myself a 2.5Kg and two 1Kg weights which seems to cover my requirements). The number of weights will depend on the camera used and the length the crane is extended to. In addition the unit also has a hook system at the handle end of the crane so that you can use your kitbag (or something else) as a counterweight as opposed to the dumbbell weights again adding to the units portability. Even better, and making the crane even more portable, iFootage make a water-filled counterbalance attachment called the Aquadrop. Retailing at £18.95 plus VAT this deep doughnut shaped bag is mounted on the handle end of the crane just like the standard dumbbells and can contain up to 4.5Kg of water. When emptied it folds down so small that it can fit into the cranes carry bag. With a maximum payload of 5Kg you could use this crane with quite a wide range of traditional video cameras and not just DSLRs. UK sole distributors, Proactive of Hemel Hempstead in Hertfordshire, recommend it for use with a whole range of popular compact video cameras (including the Sony PMW-100, NX30, MC50, NX70, Canon XA10, XF100, XF105, C100, JVC GY-HM100, GY-HM150, Panasonic AG-HMC41 and any similar size cameras/camcorders). Having said this, I found that the lighter the camera and counterbalance was the more stable the crane became. Stripping the camera down to the bare essentials certainly gave me my best results. As mentioned, the ability to create a crane movement is just one of the benefits of the iFootage M1 Mini Crane. Fully extended the crane has a total tilt length of just over 2 metres which, in practice, allows you to get your camera at least 1 metre higher than the fully extended height of your tripod. In a crowded situation this is quite a vantage point. The crane has now become part of my standard shooting kit and is taken everywhere with me. It might not always be used but its so compact and light that I might as well have it with me in case I see a creative opportunity to use it. I dont like using the word cheap but, for what you get for your money this product it goes beyond being great value for money and into the realms of costing a lot less than what you would expect for something of this quality.